Graphically, it’s not a very impressive menu, but it caught my eye. That was because the typography suggested that the menu was printed earlier than the seller’s estimate of the 1920s. Oregon restaurant menus prior to the 1930s are pretty scarce, so I looked inside: what’s to eat? 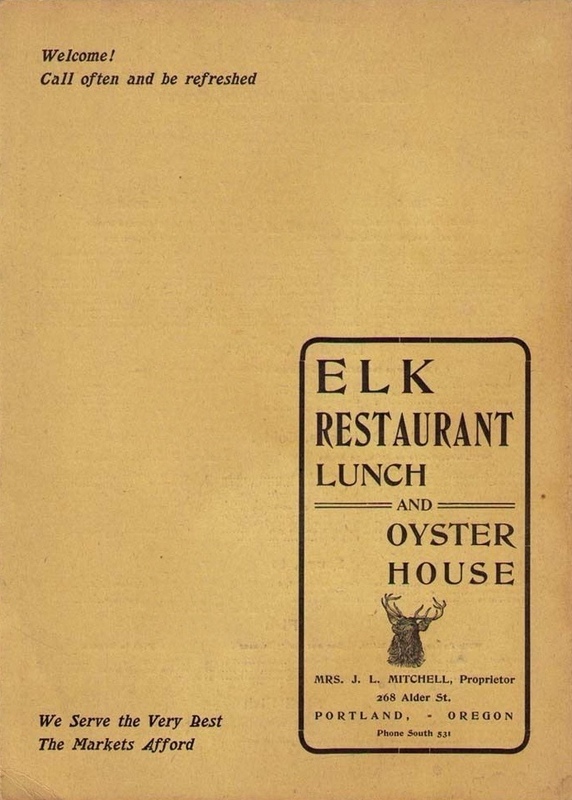 The variety of offerings, as well as the prices, represented that the Elk Restaurant, Lunch and Oyster House was a modest, middle-class downtown establishment. And the date? About 1902. The location was on Alder Street near 4th. Like many Portland and Oregon eating houses of the period, the Elk proudly announced “No Chinese.” Fear of the Yellow Peril was afoot, and many customers professed an aversion to Chinese handling the cooking. The Elk’s ad on December 8 touted “None but union labor is employed”; indeed, some labor unions were at the forefront of efforts to oust Chinese from the restaurant trade. It can be refreshing to read in James Beard’s autobiographical Delights and Prejudices of how his mother, who ran a hotel and dining room in Portland in the early 1900s, dismissed her fickle French staff and recruited reliable and skilled Chinese to replace them. How about those oysters and clams? At this time, it was still possible to get the small, native Olympia oysters, found in Puget Sound, Willapa Bay, Yaquina Bay, and other points. But the native oysters were becoming increasingly scarce, and oysters from Chesapeake Bay and other Eastern waters had been transplanted on the Pacific Coast to boost the supply. In addition, Eastern oysters could be shipped to Portland by railroad express services. At this date, the Eastern oysters were more costly. Within a few years, the small size of the Olympias resulted in a higher price for them: this was the result of the cost of labor of to shuck thrice as many shells for the same amount of food. But the Elk was not long for this world. 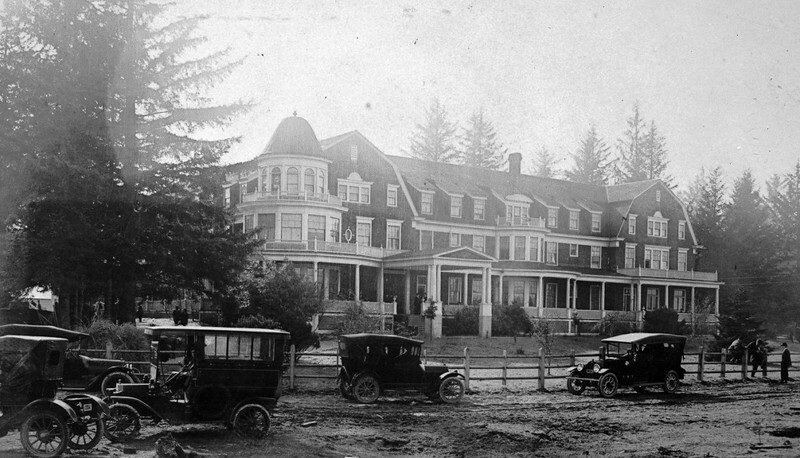 Late in the evening of February 25, 1902, fire broke out in the two-story frame building housing the Elk, with a lodging house above. The Elk was destroyed, as was an adjacent structure housing a cigar manufacturer and a dealer in teas and spices. A few weeks after the fire, the Portland Oregonian carried an article detailing the history of the buildings at 4th and Alder, which were being demolished for a new 5-story brick structure (Oregonian, April 17, 1902).